So... Last weekend we had an AscendancyLRP event at Unstone Grange, where I played several NPCs and largely avoided combat where I could. Richard has already done a write up, including some photo's of me, with more photo's on the website here. I was horribly tired most of the event and really worn out most of last week, hence the lack of an update here. What brain power I had left, I reserved for work! I was very relieved when RichS's tip about breaking out the Clearisil to remove green makeup proved to be true, as I'd made myself up for one NPC and spent the rest of the weekend wearing a faintly green beard that no amount of wetwipes would completely eradicate! Alas, no photographs of the NPC but please take my word for it that she looked very impressive. This weekend we had nothing planned, which was good considering we'd had two events back to back! This is an American publication that I found in the one newsagent (Hamilton News) in town that sells such things, while hunting for the elusive Vogue Knitting (or Designer Knitting as it is apparently renamed for the European Market). 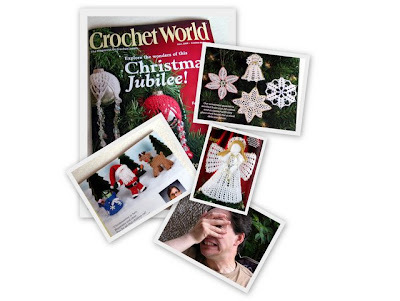 Admittedly, Crochet World is neither Vogue or knitting, but the contents caught my eye and seem to be nothing but patterns with very little editorial content. Apart from the sight of Christmas decorations in August, the reason this magazine caught my attention was the sight of a few doily patterns, because I'm on a bit of a doily kick right now. Despite having been crocheting since I was a child, I've never actually made a doily, with my efforts initially being focused on more practical things such as blankets. 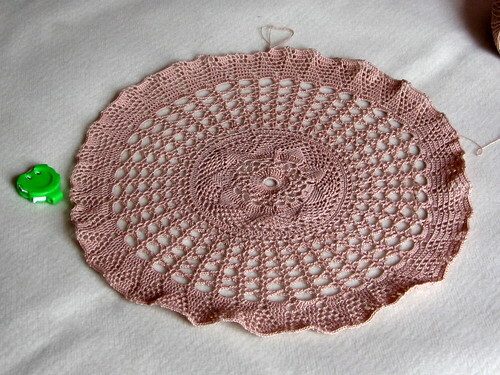 But just recently, thanks to the extensive pattern library on Ravelry, I began to see the possibility of doilies. I've become intrigued by these little pieces of lace and have started wondering about how they'd look if I used proper yarn rather than thread with much bigger hooks? 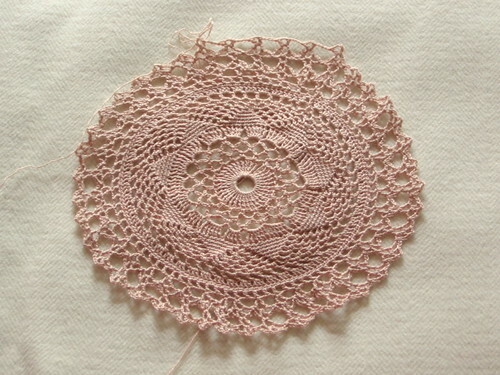 Never having made a doily before and having quite a bit of cotton thread in my stash, I thought I'd give it a go. I trawled Ravelry looking for a free and preferably old pattern that might suit this initial foray into the art of little lace coasters before settling on the Between Meals Centrepiece (Ravelry Link). This is an old pattern, circa 1917 and I originally downloaded this from Annie's Attic, but it doesn't seem to be hosted there any more and I can't find where it's moved to... I did discover some very pretty alternatives though at Free Crochet. I've included the row counter to give some idea of scale, although I haven't measured the doily as of yet. I'm expecting the stitches to open up a little when I get around to blocking it, but otherwise I'm very pleased with my progress so far. It's slow but definitely getting there! Love it! The only problem with such items (as I discovered on Blusa Queen) is that they get slower as you go along! It's huge! glad you enjoyed the event though, even if they always are a little knackering! My green legs came off in the wash fairly easily, but I was not as green as you. I am seriously impressed, it looks wonderful. cool, I keep thinking about doing something similar.